Brand new concept for lunchboxes, easily take your food to work, school or on an adventure. This eco-friendly stainless steel lunchbox has a modern design that not only looks amazing but offers a bunch of new food possibility's to make food on the go fun again. ✔ VACUUM INSULATED - The double-walled vacuum insulated exterior will keep your food cold for up to 4 hours or hot up to 2 hours. The exterior will not sweat condensation or be hot to the touch. Need a longer hold time? 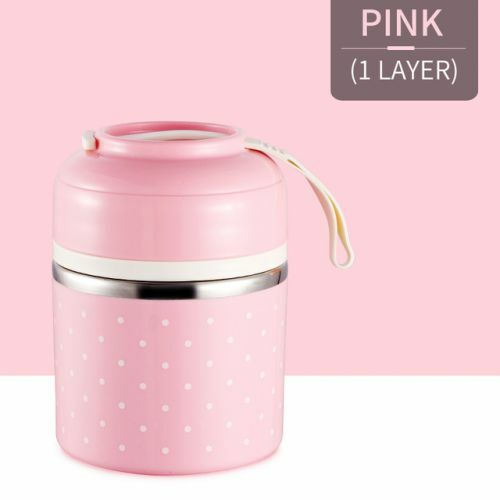 ✔ ENVIRONMENTALLY FRIENDLY - Our lunch boxes can be used again and again due to the high quality 18/8 stainless steel and a commercial grade plastic material. It's quick and easy to clean by hand. 100% BPA FREE.